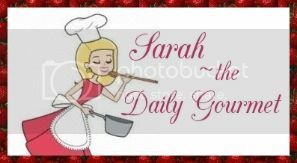 The Daily Gourmet: Gluten-free cookie dough..say what?! I'm allergic to wheat, I'm allergic to dairy, I'm allergic to soy...actually I'm NOT allergic to any of these food categories, but many people are. The folks at Cheerios were an Allrecipes product sponsor for the month of November, and I was one Allstar who was tasked with creating a recipe. This particular recipe was to be designated as Gluten-free. Not knowing anything about celiacs or gluten intolerance, I had a crash course in foods safe for those who are following a gluten-free diet. I wanted to do something a little different. I didn't want people to know there were Cheerios in what I planned on making. SO I turned to my trusty vitamix and I pulverized the Cheerios into a fine flour. How cool is this? From cheerios (or as I used to call them "donut seeds") became cookie dough worthy! The next part was figuring out what to do with the Cheerio "flour" I made. I was at a loss. I talked to my dad about the assignment. I'll take a moment to say my daddy is no stranger in the kitchen...the man is truly talented! So dad mentioned Cheerios are mainly oats, so why not an oatmeal cookie? 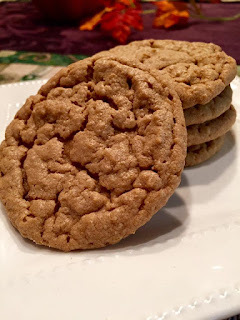 This quickly turned into me creating an oatmeal cookie recipe, but not just any oatmeal cookie. I wanted a rich note of peanut butter. So I made up my cookie dough. The next part came the baking part and crossing my fingers. I will be candid. I had NO clue if this would even work! Yeah all those ingredients and I was just hanging on by my apron strings hoping these cookies would work! Hip Hip Hooray it worked!!! So HOW did I make them? Well here is the recipe! 2. 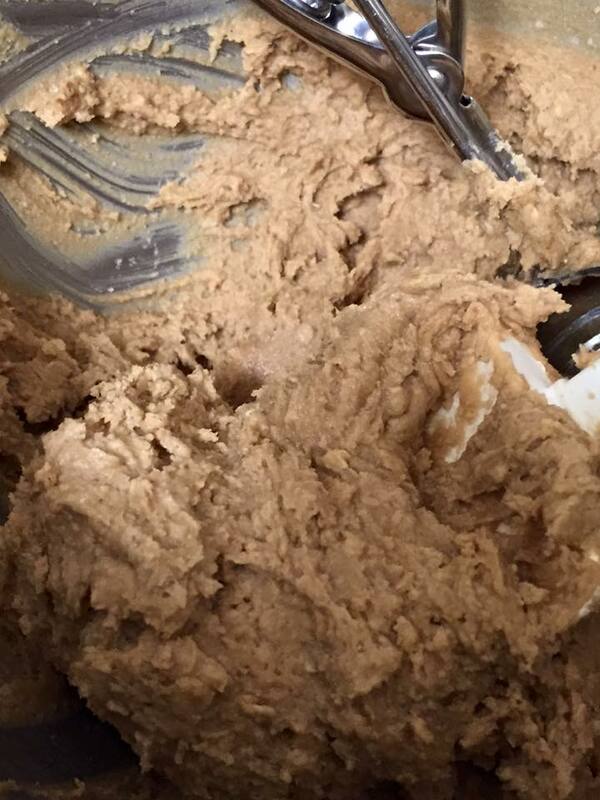 In a large bowl, cream together butter, brown sugar, white sugar, and peanut butter until smooth. Beat in the eggs one at a time until well blended. 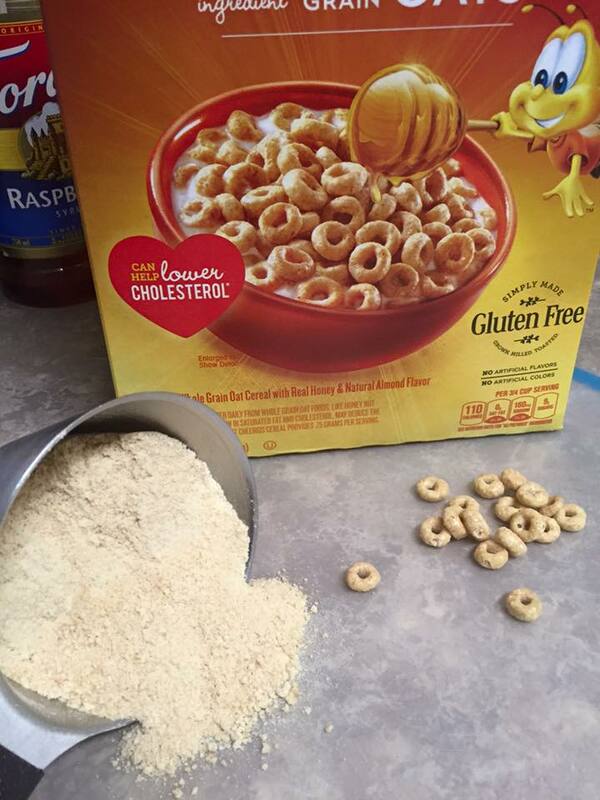 Combine the cheerio flour, oat flour, baking soda, and salt; stir into the creamed mixture. Mix in the oats until just combined. 3. Using a spring hinged cookie scoop, scoop out dough and place onto parchment lined cookie sheets. 4. Bake for 13 to 15 minutes in the preheated oven, or until just light brown. Don't over-bake. Cool and store in an airtight container. I used a Vitamix in order to grind up the Cheerios. 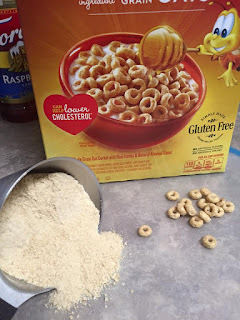 You can try another method, but you will want the Cheerios to have the texture of Flour, otherwise it may not turn out. I made my own Oat flour in my Vitamix as well. In order to confirm a Gluten-free product, you may want to purchase Oats and Oat flour certified as Gluten-free. They were absolutely delish! So tender, and moist! If you try it you'll want to let the cookies cool for about 3-4 minutes.